The Laboratory of Building Energy and Microclimate Systems of “Sunrise Valley”. Center Of Civil Engineering was established in 2010 by the Department of Buildings Energetics initiative and built the special premises funded by the University. The laboratory work area - buildings, energy supply and consumption, systems and processes research, development and application. 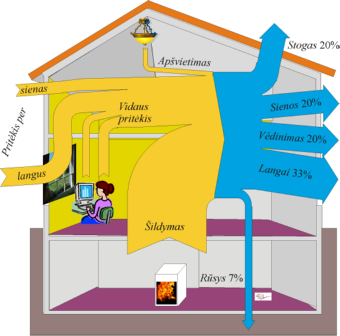 Research of rational suite to use renewable energy for heating and cooling in Lithuanian climate conditions. Research of efficient systems and equipment for energy use for building (from existing till near zero energy buildings). Thermodynamic efficiency and life cycle integral assessment for building heating, ventilation and cooling processes. Simulation and planning of energy supply and consumption systems for urban module. Through research, laboratory and its staff contribute to sustainable energy consumption and the creation of a modern building. Modelling of energy transformers and systems: TRNSYS 17.0 (buildings’ microclimate and energy demand), DESIGN Builder (interaction of construction envelopes, systems, microclimate and energy demand), POLYSUN (for processes in solar energy transformers and their systems); EnergyPro (regional/district energy supply / esp. 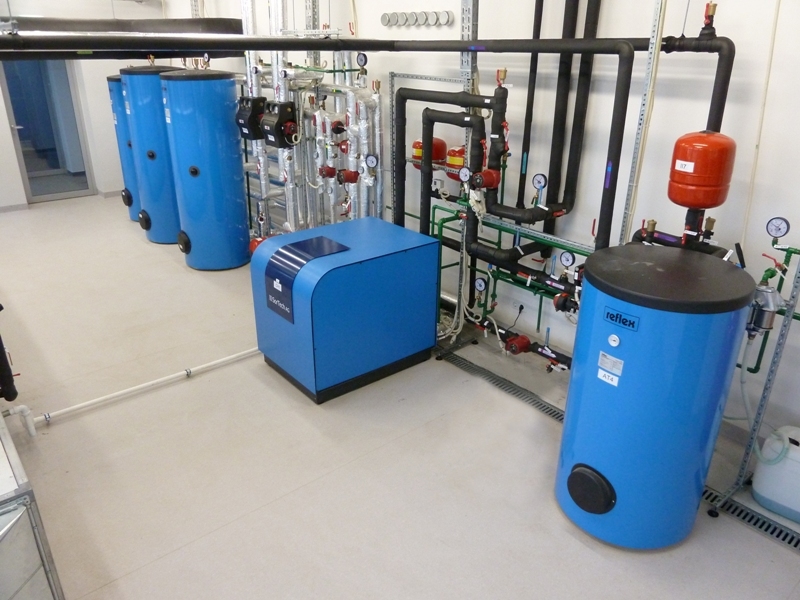 co(tri)generation), PHPP (auxiliary software for design following Passive house standard), SimaPro (Life-cycle analysis), HEAT2 / HEAT3 (two and three-dimensional non-stationary heat exchange), PHOENICS (computational fluid dynamics). 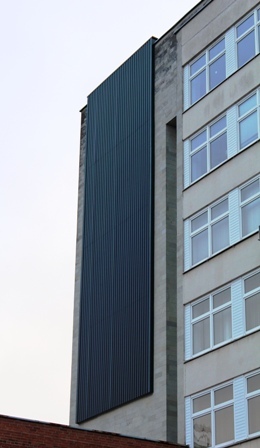 Technical feasibility studies of the use of renewable energy sources in buildings. The research covers the use of renewable energy sources, such as the Sun, wind, geothermal energy, biofuel, etc. The analysis of energy demand is conducted in order to form the balance of energy demand and capacity. The specialists perform technical evaluation of the implementation of renewable sources, select the basic technical solutions for the implementation, present economic and environmental evaluation of the suggested alternatives, and search for the financial support for the chosen alternatives (in LT or EU). Building‘s energy audit by measuring the actual energy parameters. While performing the energy audit the information on the technical condition of building’s envelopes and engineering systems is revealed. The specialists do the calculations of energy normalisation, measure the actual building’s energy parameters (thermovision, the measurement of thermal resistance of walls, windows, and roof, leak detection), create a theoretic building‘s energy model which evaluates the results of actual measurements and is calibrated with actual recorded (historical) energy consumptions in the past, identify energy efficiency measures and evaluate their economic attractiveness by determining the possible energy savings and the need for investments. The specialists can provide information or as researchers take part in projects of the increase of energy performance in buildings (ESCO). Conceptualisation (FP7, IEE), technical and economic evaluation of heat sources and integrated solutions. Energy planning: preparation of plans of DH sector, feasibility studies of settlements’ energy supply. The specialists perform drafting of special plans of DH of the area. The feasibility studies are conducted for settlements’ sustainable energy supply, focusing on the development of the use of renewable energy sources and the reduction of negative environmental impact. All the necessary documentation for the financial support of project implementation is prepared. The scientists cooperate with the Lithuanian real estate developers who establish environment and social-friendly business and plan to build settlements or districts of multi-storey buildings with extended use of renewable sources. The specialists look for the possibilities of long-term cooperation in the following areas: consulting at the design stage for the economically justified solutions, inclusion of the project in EU demonstration activities and good practice programmes, and preparation of applications for the financial support. Thermovision inspection of the building and analysis of envelopes‘ actual thermal resistance. 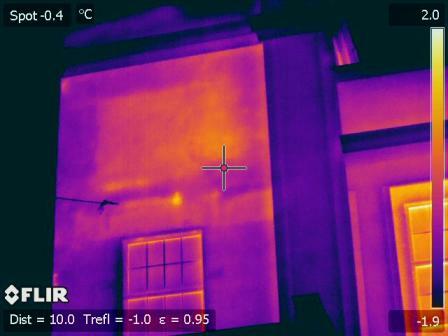 Thermovision inspection of the building‘s thermal (by photographs) and dynamic (in video format) processes. The condition of building envelopes’ thermal conductivity is identified, the possible construction defects and specific problematic locations are indicated, where the measurements of the actual thermal resistance of the envelopes are performed. The requirements of the repair of defects are formed based on the received data. 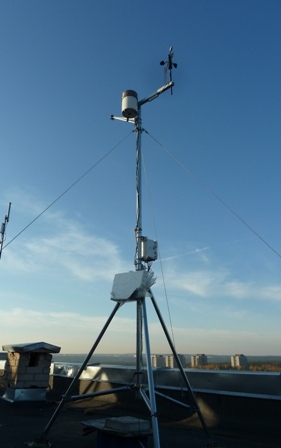 Microclimate research of buildings or premises. Measurements of temperature (air, wall surfaces), relative humidity, CO2, air-tightness, illuminance, and noise level are taken. The received results are analysed and the conclusions on the possible problem solving are presented. Leak detection in buildings or premises. 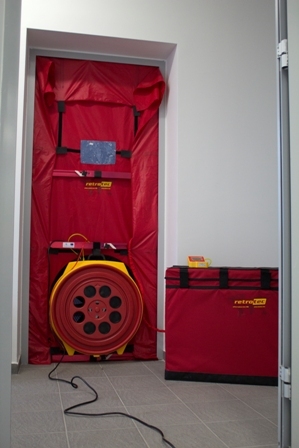 A pressure test is performed in the building or premises. 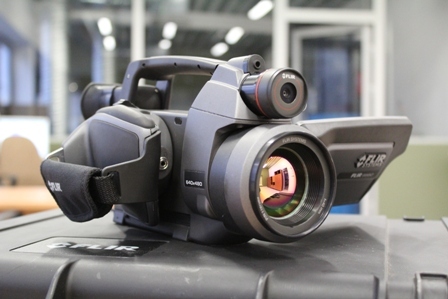 The problematic locations are identified by thermal imaging camera. Air exchange rate in the building or premises is indicated at 50 Pa pressure difference. The received result is used as datum for buildings’ certification. Analysis of ventilation systems. The measurements of air velocity, pressure in ducts are performed. 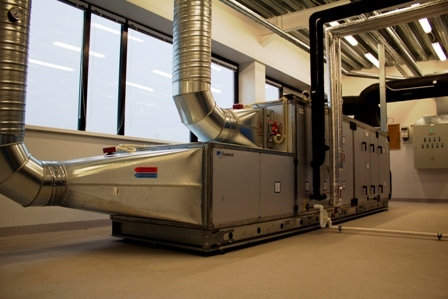 The received data is used as an auxiliary tool for the combination of ventilation systems. Experimental research of small capacity heat transformers. The research identifies the seasonal energy effectiveness of small capacity (up to several tens of kW) transformers (i.e. heat exchangers, heat pumps, refrigeration equipment, boilers, etc. ), the characteristics of operational regime of the device, the influence of new components or new device modification on the performance of the device. The recommendations how to improve the effectiveness and how to combine the listing and transformation modes are presented. 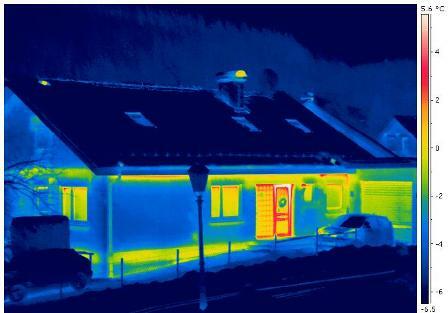 Legal regulation for building’s energy efficiency. Preparation of legal documents, help to transposit of EU directives’ regulations into Lithuania’s legal framework. In 2010 January 22 VGTU Building Energetics Department was granted a licence to organise training courses for specialists who intend to perform energy audits for buildings. The participants who follow the auditors’ training courses and pass the exam acquire a certificate. 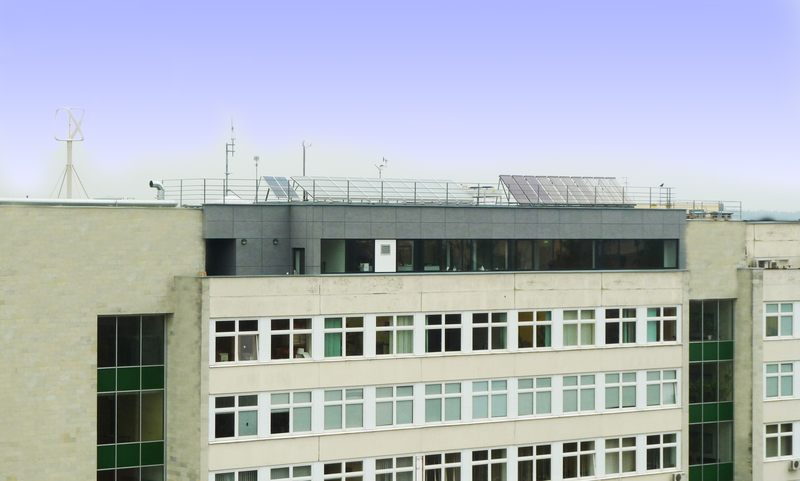 The laboratory, together with the Department of Buildings Energetics are currently to tests using modern computer programs, such as EnergyPro, EnergyPlus, SimaPro, Phoenics, TRNSYS, MATLAB + Simulink, METEONORM et al. The skills of Department researches to use the software were acquired while studying as traineeships in foreign universities through joint projects.